Your loved ones, may be faced with two choices in order to meet any CAT liability on your estate – either dip into their own resources or sell part of their inheritance. Having to sell part of their inheritance to meet the tax liability may be a very hard choice to face, especially going through the very difficult period following the death of a parent. It is obvious from this article that selling the family home what a lot of people are being forced into doing today. Yes, you can alleviate a loved one’s liability to inheritance tax. By effecting a Section 72* life assurance policy, you will continue, unhindered by death or serious illness, to protect loved ones by providing a cash sum which will fund the CAT liability arising on the benefit they inherit from your estate. For example Mr and Mrs Kelly are aged 55 and their estate, valued at €3,000,000, is to be divided equally between their three children. Their children’s inheritance tax bill will be €767,250 – i.e. 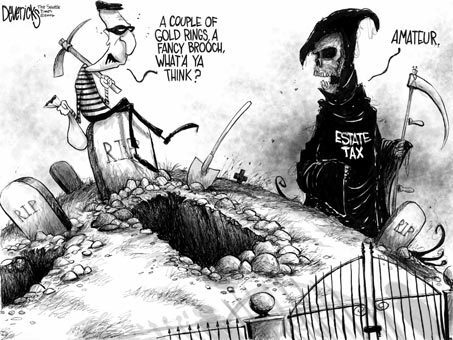 25% of the estate will be taken in tax. The solution is to use a Life Long Insurance plan with life cover of €767,250 to pay the tax bill. The premium (exclusive of the government levy) is €8,729.12 per annum. 3.Put life cover in place to protect the estate at a cost of 1.25% of the tax bill using a Life Long Insurance plan. This entry was posted in Pensions, Protection, Tax, Wealth and tagged Complete Financial Advice, Inheritance tax, Ireland, Tax, Wealth. Bookmark the permalink.